Jeffrey M. Verdon, Esq. is an internationally-recognized advanced estate planning and asset protection attorney who has been presenting at various corporate and investor conferences such as the Money Show and Freedom Fest, as well as investor cruises (including InvestorPlace Media, Crystal Cruises, and Oxford Club), for over 20 years. Mr. Verdon’s presentations, which are primarily geared towards high-net-worth investors, business owners, and professionals, cover key estate planning, asset & lifestyle protection, and taxation planning topics. 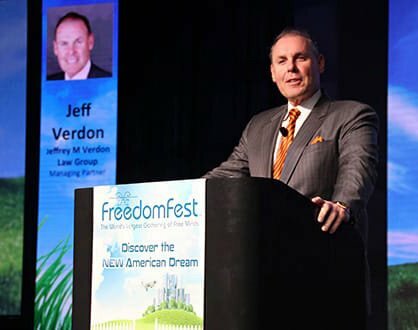 During his dynamic, high-energy, and informative seminars, Mr. Verdon reveals advanced legal strategies that thousands of high-net-worth clients have utilized to prevent loss due to frivolous creditor claims and to ensure that their estates pass to their heirs without being reduced by estate taxes. Affluent families and business owners are frequent targets of lawsuits. Without the proper forethought and planning, if sued, you can expect to spend a fortune litigating cases, filing for bankruptcy, or simply paying the claims for lack of a better option. Frivolous lawsuits are on the rise and more and more individuals are turning to comprehensive estate planning and asset protection planning as a first line of defense to protect not only their assets but also their legacy and lifestyle against potential creditor claims. Premium Financed Life Insurance is a “disruptive technology” that has transformed the manner in which large life insurance policies are purchased today. The NING Trust is a trust to shelter CA source investment income and out of state capital gains using state income tax savings to create a secondary asset class called life insurance. Jeffrey M. Verdon and Julian Movsesian, the man who invented it 20 years ago, will explain the fundamentals of Premium Financed Life Insurance. When combined with the NING Trust and the HYCET Trust, Premium Financed Life Insurance can be a powerful financial planning and income and estate planning tool. This workshop is exclusively for women. It is a fact that over 90% of women will at some point in their lives be solely responsible for their finances, making estate planning an essential topic for women. In this high-energy, interactive seminar, attendees will learn all the pertinent issues women should know about estate planning and how to prevent the pitfalls of a poorly planned estate. Presented by one of the country’s leading estate planning lawyers, you won’t want to miss this workshop! What are the critical tax and estate planning considerations under the Obama administration and its proposed tax law changes? Are your assets properly protected from a potentially financially-ruinous lawsuit? Do you know how to convert your taxable investment income to tax-free income? How can your estate capitalize on the economic recovery? All of these questions and more will be addressed in this dynamic presentation given by one of the country’s leading taxation law and wealth protection planning attorneys. If you are a successful investor who wants to be armed with the critical knowledge to ride this economic storm and be prepared for the changes under the current administration, this seminar is a must. Asset and Lifestyle Protection—Offshore or Domestic?